I love things that are tattered ... things that are old ... things that are raggedy ... things with a history. Lately I've been sharing my love for some of these things with the Mulberry Bears I've been creating. I thought I would share just a few of my newest items. And ... wish you a very happy and safe weekend!! I would like to wish Andi a very Happy Birthday! I'm lucky to know Andi in "real life" and I have to say ... she is one of the kindest, sweetest, most competitive (LOL you know know what I mean Andi!) people I know. Griffin fell off the couch on Saturday and when he did ... he hurt his foot. All weekend it bothered him and he was walking on it crooked. Yesterday I decided I better take him to the doctor to have it checked out. We first went to the pediatrician to see Dr. Terry. He took a look at it and told me we better have it x-rayed. He thought everything was okay, but because he's so young there was a chance he could have damaged the growth plate and that could cause problems in the future. So ... after waiting at the pediatrician's office for almost 2 hours ... we headed to the hospital. Again ... waiting. We were finally called to give our information and then sent to radiology ... you guessed it ... more waiting. Finally it was time to enter the x-ray room and they took several x-rays of his foot and ankle. I felt so bad for Griffin ... he's 2 and he likes to run and play. He was pretty much confined in his stroller all day yesterday while we WAITED. And let tell you that was no fun for him or me. Finally ... we got back in the car, I put him in the car seat and he fell right to sleep. I got him home, put him down in his crib and he slept until almost 6:00 pm. Dr. Terry called and said it was just bruised ... thank God!! He just needs to take it easy for a few days. Really ... it's not slowed him down one little bit. 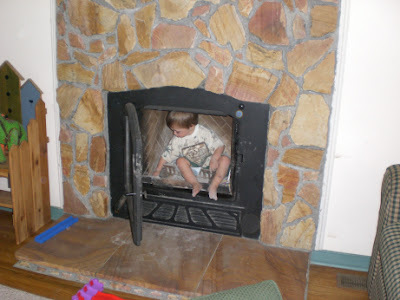 Can you imagine trying to tell a 2 year old he needs to take it easy on the foot. LOL. Not many people think of Florida as "the south" ... but it is as south as you can get ... lol. 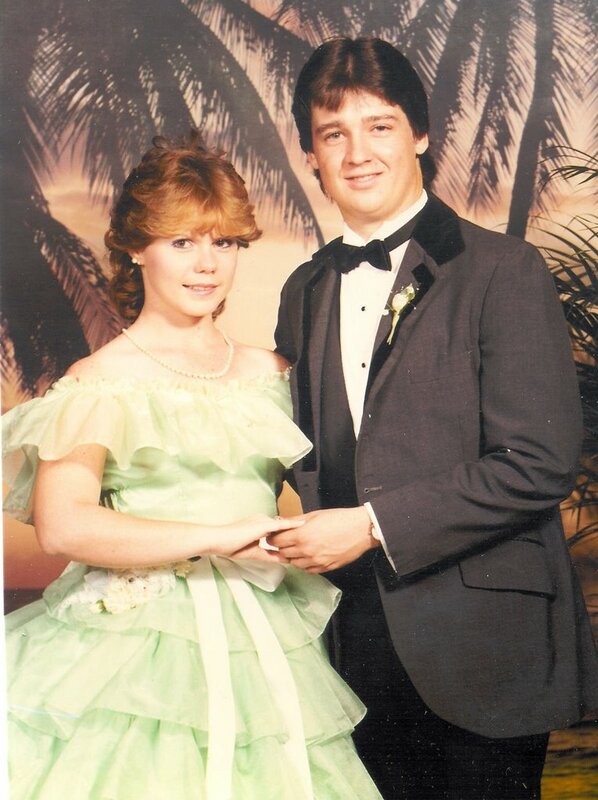 Now ... these "Southern Thangs" are coming from a gal that wore this seafoam green Cypress Gardens Southern Belle dress (complete with hoop mind you) to her Senior Prom at Disney World. And yes ... that is my dear sweet husband Mike ... we are high school sweethearts (been together 22 years). So ... here goes ... not sure if this is the way I'm "supposed" to do it ... but it's how I'm doin' it. First off ... FAMILY is the most important thing. We love our families ... and would do anything for them. Like most southern children I called my Mother by the name of Momma. And I called my Father by the name of Daddy. Still do. Even though I'm almost 40 years old and they are both deceased. They will ALWAYS be my Momma and Daddy. FOOD ... now that's a biggie ... I could write a book on southern food. We have our FRIED okra, FRIED green tomatos, peas with snaps and cornbread. Now, there are lots of other southern foods ... like neck bones and rice ... but that might gross you out. I was raised on southern food. And I love it to this day. Southern children know shopping carts are called buggies. And they know when you say "gimme some sugar" it doesn't mean to pass that fine white granulated stuff. They know "gimme some sugar" means give me a kiss. Words such as "Hey", "ya'll", "yon't" are freely scattered among our normal every day way of speaking. Although some of us try to clean it up a bit when not around other southerners. We have memories of eating watermelon cut in half out on the picnic table with our spoons and salt shakers. We have memories of running barefoot eating popsicles as they dripped gooey, sweet goodness down our sticky little arms. And you want something to drink? How about some BREWED sweet iced tea. None of the fruity flavored instant mess for us. BREWED sweet iced tea is most definately the Housewine of the South. Afternoon thunderstorms is another southern thang. Oh my yes ... you can count on it. Every afternoon you can count on a shower or thunderstorm to come through ... but in the south rain dries up quickly and we'd be right outside again ... in no time flat. Kindness matters in the south. Some folks call it southern hospitality. It's so very important to be kind and show others you care about them. Doesn't matter if it's family, neighbors or the newspaper delivery person. Just be kind and treat others like you want to be treated is ingrained in southern children. Here it is folks ... Fort Griffin! It was quite a tedious task to get this thing together. We bought the kit the day before Mother's Day and it was officially finished and play-worthy the day before Father's Day. I have so many pictures of it under construction ... but I thought I would share only the finished pictures today. Mike worked soooo hard on this project. It came wood stained, but he decided before putting it together he would weather/water proof each wooden piece before putting it together. There were 1,000s of pieces to this set!! It came with a manual with 99 steps to completion. This picture (above) shows Mike just finishing it up ... the tools are still everywhere. Mike is giving Griffin his first ever swing on the set. That's my boys! And this is Fort Griffin minus the hubby, the boy and the tools. 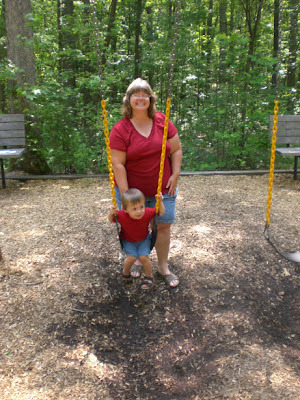 This is a picture of Griffin and me taken at Fighting Creek park in Powhatan. Rarely do I get a picture of him and me together ... so when I do ... I treasure it! Okay ... here's the deal. Virginia requires an annual vehicle inspection. Ugggh ... I hate this! The dealership where I bought my Jeep offers FREE annual inspections for those of us that bought our vehicles there. The only thing is, it's ALL the way in town ... then I'd have to wait probably HOURS to have it done. Now ... we have a little local auto shop that can probably get it done in 15 minutes and they charge me only $15.00. Which would you do? 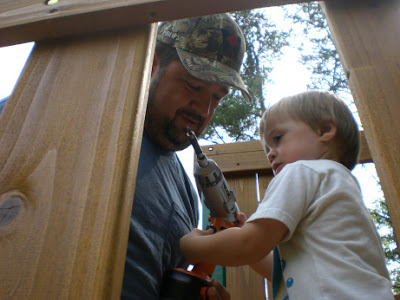 Just look at my sweet husband (Mike) showing our sweet son (Griffin) how to drill. They are working on his new play set ... and we are hereby dubbing it "Fort Griffin". It's done ... finished! Yeaaahhh!! I promise to share pictures soon. We had a pretty uneventful weekend and a very quite Father's Day. Mike took it easy most of the day ... well, except for seeking revenge on the dreaded Japanese Beetles that are once again trying to invade our crepe myrtles and anything else flowering. Ughhh! They are horrible. I've been a pretty bad blogging buddy lately. 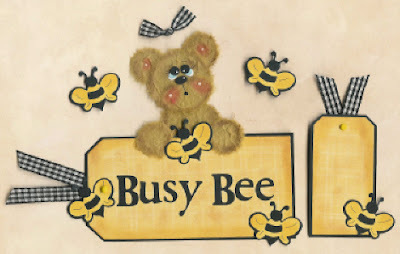 I just can't seem to find the time to blog ... or even to visit my blogging friends. As you know, I have this verrrrry slow dial up connection and it makes it near to impossible to visit any websites or blogs that have alot of images ... ... but ... alas ... I will try to visit as often as I can. And I promise to try to get back to daily blogging. Now ... question for you ... it's 1:00 am ... do I count this as my Tuesday blog or can I officially count it as my Wednesday blog since it's after midnight? First of all, I can NOT believe I'm up at 1:00 am. I must be CRAZY! Griffin will be up in 5 hours and he will most definately expect Mommy to greet him with a warm, sweet smile. So ... I guess I better head to bed so I can fester up that warm, sweet smile for my dear, sweet boy in only 5 hours! Toodle-loo ... 'til next time. I wanted to blog about something today as it is heavy on my heart. I know I probably won't have time tomorrow ... so ... it's a day early. My Momma (Syble) and my cousin Kim both shared the same birthday of June 16th. When I was a little girl I thought that was pretty neat. The sad thing is neither Momma or Kim is alive to celebrate their birthday tomorrow. My Momma would have been 74 and Kim would have been 40. Both of these wonderful people passed away far too young. My Momma was only 43 when she died ... and Kim only 39. It's so sad ... Kim did not live to see her 40th birthday. I will be 40 in September. I can hardly believe it. I used to think 40 was SO old. Now, I realize, it's not old at all. I don't know what it is ... but I think once I pass the age of 43 I will feel differently somehow. I know my sister did. I just know I wish I had both of these people, HERE ... with me now ... so I could tell them how very much I love them and miss them. 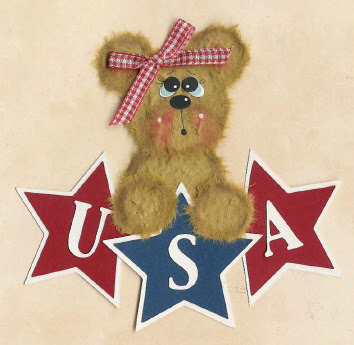 I love all things Americana ... so I decided to make an American Flag Mulberry Bear. I grunged it up a bit ... I like things like that ... a little worn. I have to share a great customer service story about our local grocery store. Honestly, I can not say I've gotten GREAT customer service from anyone lately ... until yesterday! Our local grocery store had Breyer's Ice Cream on sale 4 for $10.00. Yesterday was the last day so I decided I better stock up before the sale was over. So, I went over to the ice cream aisle and the freezers are EMPTY. There were two people there stocking from a huge frozen box of ice creams ... so they asked me to come back. After about 10 minutes I went back and found my Light Chocolate Mocha Silk (it's yummy!) and I was looking for the Light Cookies 'n Cream for Mike. It wasn't out yet and was not on the perimeter of the ice creams I could see. So, I decided to just get the regular Cookies 'n Cream. This store was sooo busy and I had to wait in the check out line for a really long time. As the lady was about to scan the regular Cookies 'n Cream ... the man from the ice cream aisle came running over and said ... "Here's the light cookies 'n cream you wanted". Wow!! He went out of his way to make sure that I got what I wanted. Now THAT was excellent customer service!! Oh, my!! 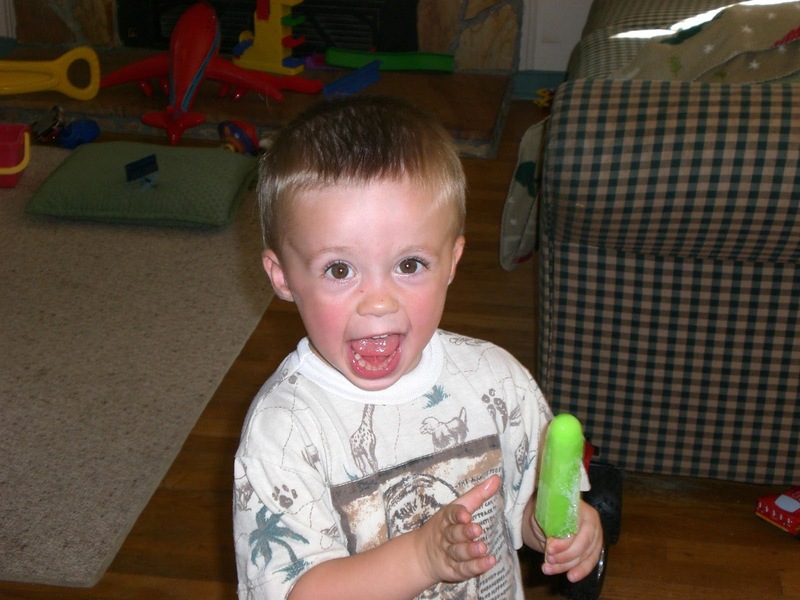 Today Griffin had his first popsicle. He loved it!! It's been far too long since my last blog. I've been busy being a wife, mommy and throwing in a bit of creative time in there as well. Nothing exciting has been happening around here. 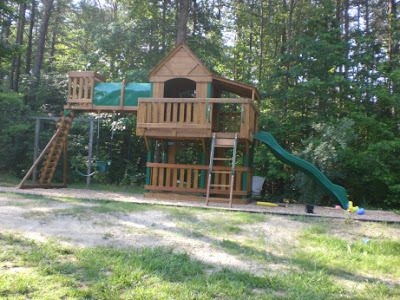 I've just been having alot of fun spending time outside with Griffin and Mike working on the playset. It's almost like a house! We will get it done soon. 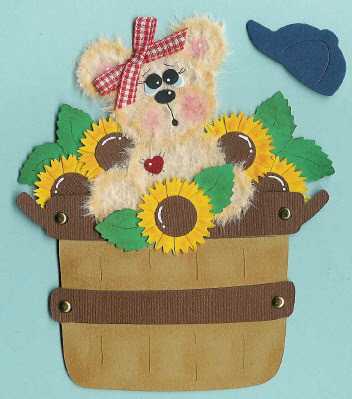 I've also been having alot of fun creating new Mulberry Bears. It's so nice to have some new ideas. They just keep coming. I just wish I had more time in the day. When Griffin is awake ... there is NO time for working. He's 2 ... and he is FULL ON 2 right now. I wanted to share the picture above. 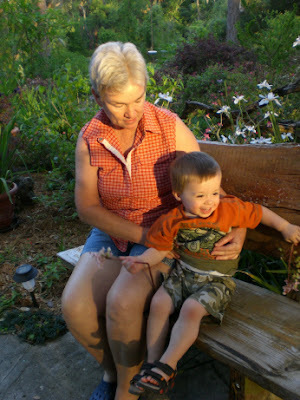 It is Griffin with his Nana Jeri (Mike's step-mother). This picture was taken in Ray & Jeri's garden in Florida. I just love how the sunlight is radiating on them. Well ... as I mentioned Griffin is awake ... and it's time for another ba-na-na Mommy! I have nothing to blog about today ... so I am sending you a smile. I took this picture at the Sun 'N Fun Airshow in Lakeland, FL when we were there in April. 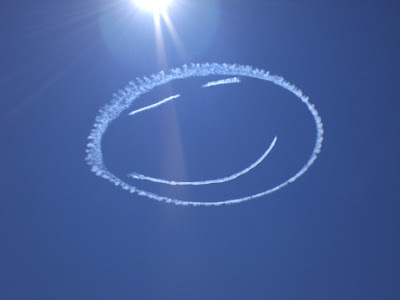 I love sky writing ... and I loved this smiley face the pilot created! Just thought I would send you a smile today. Over the past couple of years we've had to have a number of dump truck loads of dirt and gravel delivered to our house. 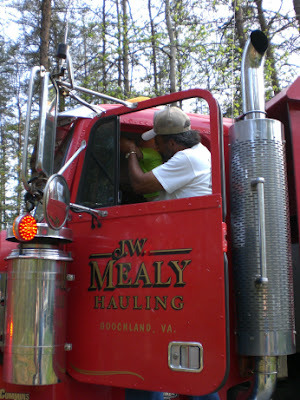 Jerry Mealy was highly recommended to us by a neighbor, so we gave him a call and he's delivered everything we've needed for our drive-way and construction dirt/gravel needs. Mr. Mealy is such a nice guy. A genuinely nice guy. He always plays with Griffin and would always ask about our dog Wyatt. A few weeks ago we had to have two dump truck loads of dirt and one load of pea gravel delivered for the landscaping area of Griffin's play ground. 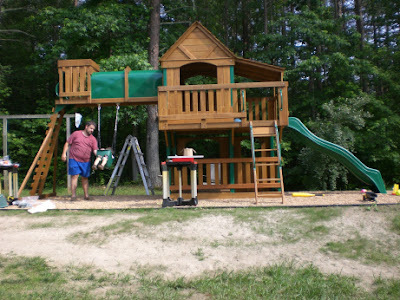 We are still working on the playground ... and I will share pictures of that soon. 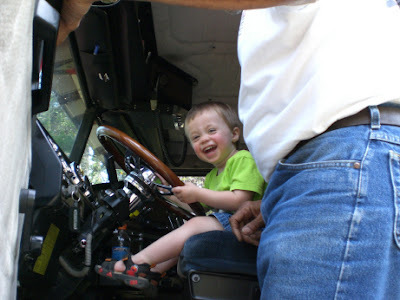 This time, Mr. Mealy picked Griffin up to sit in his truck ... he had a ball in the big red truck!! Griffin blowing the horn on the big red truck. And here he is in the driver's seat ... just look at the smile! 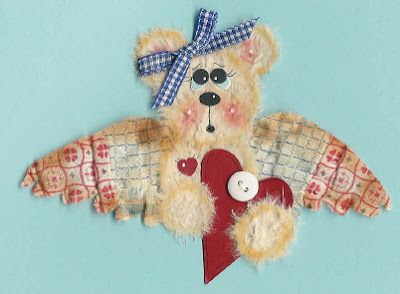 I've been having fun creating some new Mulberry Bear Paper Piecings. It feels really good to have some new, fresh ideas ... may I share a few with you? I created all of these for Ebay ... I have a few more ... but didn't want to bore my blog readers with too many. If you have an interest, just click on my Ebay Link on the right side of the screen to see these, along with several more. This started out COMPLETELY different than the finished item. See the little tag on the right? That's the tag I started with ... but it was too small to do what I wanted, so it ended up being a journaling tag. Of course I got the inspiration for this paper piecing from our visit to the strawberry patch a few weeks ago. With all of the red, white and blue flags proudly waving this past weekend (and still) ... 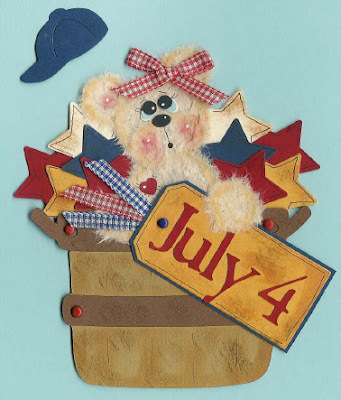 I couldn't resist making a patriotic paper piecing. 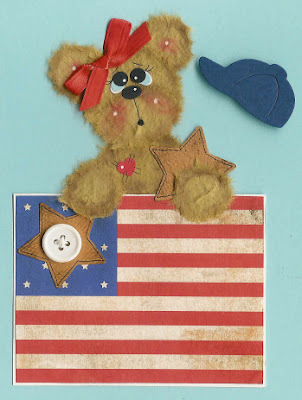 I just LOVE all things Americana. 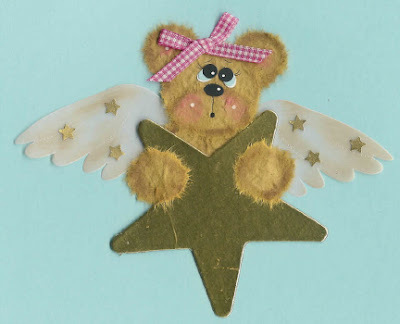 The other day Terri mentioned that I should make an Angel Bear ... and it's so funny, when I read her comment I already had an Angel Bear drying on the table! 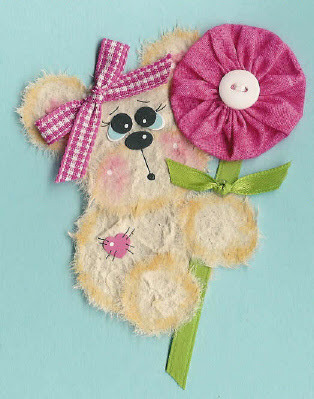 I just wanted to make something "girly" and I love making yo-yo flowers. I used to make these all the time and thought ... hey ... 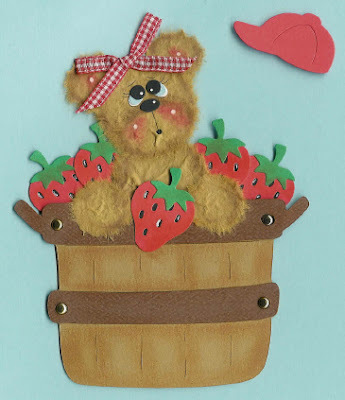 I can make a Mulberry Bear holding one! So ... I dug out my "fat quarters" from the back of the closet and made a bright pink yo-yo posie ... such fun! Okay ... that's it for now. Mike is on his way back home from Ohio. He was there again this past week. It will be SO nice to have him home! We wish you a very SAFE and HAPPY weekend!